Though the BBC Press Office has yet to officially confirm a fourth season of mega-hit mystery series Sherlock despite the fact that Series 3 officially has officially wrapped in the UK, this hasn’t stopped the show’s creators from talking about it as though things are a done deal. Which, I think we’re all probably fine with, given the circumstances. And, if you need to feel even more reassurance: co-creators Steven Moffat and Mark Gatiss have confirmed that they’ve already plotted out not just what will happen in Series 4, but Series 5 as well! “Rather excitingly, Mark and I, for no particular reason, we just got out of the rain and sat at the top of the production bus… and we just started plotting out what we could do in the future,” Moffat told an audience gathered for a BAFTA screening of the Series 3 finale last week. “The ideas we had that day, I thought were the best we’ve ever had,” he explained. Team Sherlock has talked rather frequently about their love of doing the show and their desire to see it continue, mentioning often that the creation of Series 4 was really going to come down to availability, and how soon they could manage to get everyone together to make it. Moffat and Gatiss are a bit busy with this other British you might have heard of called Doctor Who, and stars Benedict Cumberbatch and Martin Freeman have become rather in-demand performers over the past couple of years. So, it’s not a surprise that scheduling might get a bit tricky for all involved. But all hope is not lost. In fact, there’s every indication we might have less of a wait this time than that two-year gap between Seasons 2 and 3. “We’ll get them made as quickly as we can,” promised Moffat. As for an official announcement about the series’ future, well, I expect we’ll see one when we see one. Perhaps word is being held until after the show concludes its American run of Series 3 beginning on January 19, since the two transmission dates are so much closer together this time around. But, since everyone involved with the show seems to be operating under the assumption that it’s continuing, and no network is going to turn their nose up at viewing totals like the set that Sherlock just notched during its UK run, and well. I expect it really is all fine. But actual confirmation would be nice though. Just saying. I’m an anxious person at heart. Until then, I guess we’ll just have to see what other tidbits Moffat and Gatiss might drop for us about Series 4 (and 5??) in the days and weeks to come. 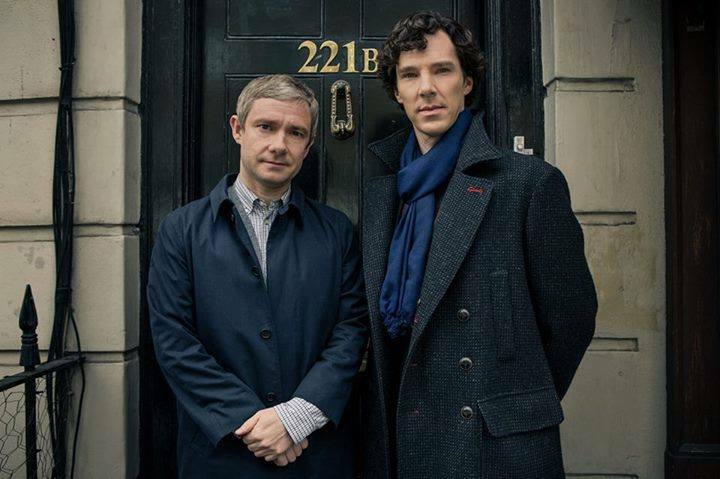 Are you excited about the prospect of Sherlock continuing on after Series 3? How long would you like to see the show go on?